Step 1: Unscrew copper lead and connection nut inside threaded connection to gas line. 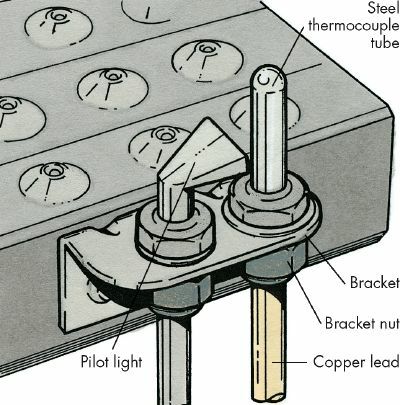 Under mounting bracket at thermocouple tube, unscrew bracket nut that holds tube in place. Step 2: Insert new thermocouple into hole in bracket. Be sure steel tube is up and copper lead is down. Under bracket, screw bracket nut over tube. Push connection nut to threaded connection where copper lead connects to gas line. Make sure connection is clean and dry. Step 3: Tightly screw nut into place, but do not over-tighten. Both bracket nut and connection nut should be only a little tighter than if hand-tightened. it in place, steel tube up and copper lead down. The limit switch is a safety control switch located on the furnace just below the plenum. If the plenum gets too hot, the limit switch shuts off the burner. It also shuts off the blower when the temperature drops to a certain level after the burner has shut off. If the blower runs continuously, either the blower control on the thermostat has been set to the ON position or the limit control switch needs adjustment. Check the thermostat first. If the blower control has been set to ON, change it to AUTO; if the blower control is already on AUTO, the limit switch needs adjusting. To adjust the switch, remove the control's cover. Under it is a toothed dial with one side marked LIMIT; don't touch this side. The other side of the control is marked FAN. There are two pointers on the fan side; the blower goes on at the upper pointer setting and turns off at the lower pointer setting. The pointers should be set about 25 degrees apart. Set the upper pointer at about 115 degrees Fahrenheit and the lower one at about 90 degrees Fahrenheit. If you smell gas while performing these repairs, you'll want to get that leak taken care of right away. Learn how to find gas leaks on the next page. Furnace Maintenance: Save yourself time and money by learning the steps to keep your furnace in prime condition.